Hello, it’s Tina here! 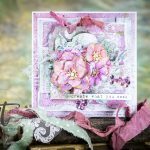 Today, I’m here to showcase the You Mean The World die template from our Simply Said Collection. This collection was created to give the ability to create a quick but “looks like you spent hours” card. 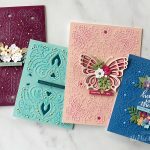 I am going to show you how to create a masculine card (without the glitter, bling and bows) – all you need is the die set, adhesive and cardstock! 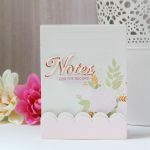 Create card base 4¾ x 6″ (with fold along the top). Trim brown cardstock slightly smaller and adhere to card front. Place dark green cardstock on Platinum Clear Cutting Plate, nest You Mean the World Inset and Border dies on top of cardstock and cover with second clear cutting plate. Place onto Platform and run thru Platinum Machine. To Emboss: Keep paper in the die. Place onto platform and cover with tan embossing mat and purple embossing plate. Run thru machine again. Repeat Step #2 and #3 using Cuddle Cream Cardstock. Keep in die template for now. Adhere green die cut from step #2 & #3 with lighter green cardstock that is slightly larger than the die cut. Adhere to card front using foam tape. Using Tool ‘n One™, remove cream coloured letters from die template. Adhere to card front in the correct place to spell out the words “World” and “to me”. Remove pieces from globe and add them as well. Note: The fun thing is now you can create a second card, reversing the colors. A cream colored card with green lettering. The die cutting is already done for you. I told you this die set was simple to use, and I was right! Now it’s your turn. Use some of the negative pieces to fill in the spaces. Try different colors, using as much or as little as you like. The possibilities are endless!